As an introductory activity to our Canadian Geography unit in Social Studies 10, the TALONS are digging into our Flickr archives today and applying some new skills of photo-editing to add a sample of their own reflection to a picture they think defines an essential British Columbia. 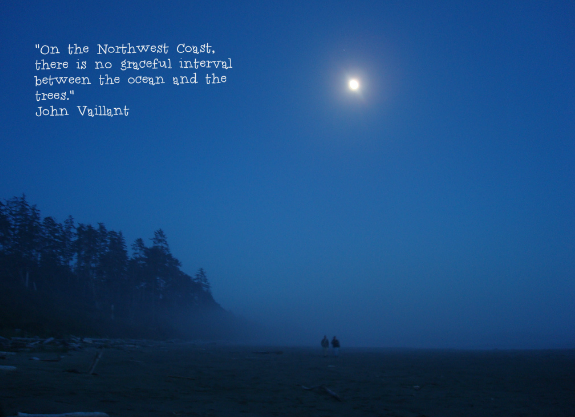 For my image, I chose this moonrise shot from the first Adventure Trip I had the pleasure to teach, when we found ourselves camped in the forest above Long Beach, in Tofino, where John Vaillant‘s description of the Northwest Coast from the opening chapter of the Golden Spruce, and the interplay between forest and sea comes into clear focus. You can see the fruits of the assignment accumulating in this Flickr set.